A Criterion box set of silent goodness. You can practically feel the director itching in every frame�talking pictures are on their way, and soon; Miss Dietrich will soon re-appear and become his muse. These three silent pictures are marvelous instances of Josef von Sternberg at the peak of his craft, and demonstrate just how much latitude he was able to eke out of so many genres, bringing a particular visual sensibility to all his material, and yet trusting his audience to follow him. They did. And you should, too. The first film in the set, Underworld, comes with its own title card bragging that the movie established the template for gangster pictures to come�that's a lot to claim, but it turns out, it's right. The film is a great, sinister marriage of von Sternberg's Expressionist aesthetic�it wasn't called art house cinema back then, but today it would be�with the pulpy streetwise sensibility of writer Ben Hecht. (He would shake free of von Sternberg's overly pretty pictures a couple of years later and write the script for perhaps the most iconic gangster picture, Scarface.) The director already demonstrates an uncanny eye, both for the grand, sweeping establishing shot, and for the telling detail�the femme fatale here is a trampy little thing called Feathers, for instance, and when she's introduced, a wispy castoff of a ratty boa wafts onto screen, preceding her appearance, telling us all we need to know. It's a peculiar film in some respects, sort of bottom heavy with story�the first half of the movie is more interested in atmosphere than plot, not the kind of dramaturgical technique we associate with silent pictures. Our hero�if you can call him that�is a nasty piece of work called Bull Weed, played by George Bancroft in a terrific performance; Weed's nemesis, Buck Mulligan, is neither stately nor plump, but even in a silent movie, we can tell that he's got a mouth. Bull gets into it with Buck, and with Rolls Royce, his corrupted consigliere; there's even the suggestion, in this pre-Code world, that Royce might be gay ("I'm not interested in women," he declares to Feathers), but her womanly wiles are the undoing of all of them. It's bracing to see how confident von Sternberg is with his visual storytelling�there are very few intertitles, because the moviemaking is so good, and no doubt because producer B. P. Schulberg had an eye on the international market. And some of the images are indelible, especially in a bacchanalian sequence (what the film calls "a devil's carnival"), with horrifying shots like Weed staggering drunk down a corridor, thigh deep in streamers and confetti. Either of the musical scores will do�the Alloy Orchestra's is a little brassier than Robert Israel's�and in an accompanying visual essay, UCLA Professor Janet Bergstrom talks us through von Sternberg's early career, and how he became a director, veering toward the mainstream rather than the avant garde. The director goes about as old world as you can in the next picture�The Last Command is in its weird way an elegy for Russia before the Revolution, more Anastasia than Reds. Emil Jannings gives a moving if occasionally maudlin performance in the lead role�he plays Grand Duke Sergius Alexander, cousin to the Duke, if you please, now reduced to, essentially, self-mockery. He's living a threadbare life in Los Angeles, finding work only as a useful and quite convincing extra in Hollywood pictures about Mother Russia. Structurally, it's a funny sandwich of a movie, with two extended backlot sequences bookending an elaborate flashback to the Grand Duke in all his glory�both are opportunities for Jannings to rip it up, and in Act Three he even gets his Norma Desmond moment. It can be kind of tough to take the aristocrat as martyr, or even as action hero; but you get the sense that von Sternberg is more aesthete than politician, and cut him some slack. The disc comes with two more options for the accompanying score; both seem to be heavy with sinister incarnations of The Internationale. Also on the disc is a visual essay (36m:15s) on von Sternberg's silent work, by Tag Gallagher, a piece which is ponderous almost to the point of self-parody. George Bancroft returns for The Docks of New York, which features a screenplay by Jules Furthman, who would make the transition to talking pictures just fine, thank you, with credits on everything from Shanghai Express to The Big Sleep. But you get the sense that von Sternberg's interests here are more architectural or sociological or industrial than they are personal�it's a film that's got many similarities to the photographs of Charles Sheeler, for instance, and shares with Upton Sinclair's The Jungle a sense of a dramatic story as little more than a useful pretext for making larger points in the public square. Nevertheless, it's kind of extraordinary, especially the great period footage of New York's waterfront, before so much of the skyline as we have come to know it was yet built. Bancroft plays Bill Roberts, who toils as a stoker in what truly seems like the bowels of hell�von Sternberg truly shoots the place of work as if it were Satan's boiler room. Bill and his buddies get one night of leisure, and their foreman knows that no good can come of this. The movie bears him out, as the boys head to The Sandbar, a den of iniquity�Bill encounters and rescues a damsel in distress, whom willful ignorance keeps him from seeing as a suicidal tramp. The movie is ostensibly about their sordid courtship and finding an iota of humanity in a land of industrial repression; a lot of the second half of the movie feels like the stuff of cheap melodrama. (Well, it *is* the stuff of cheap melodrama.) Von Sternberg is relentless with his images of industrial squalor, and yet he finds a kind of beauty in the built environment, too, even if his characters would find aesthetic appreciation a stupid joke or a fool's errand. The principal extra on this disk is a 1968 Swedish television interview (39m:43s) with the director (who speaks in English), pegged to the release of his memoirs; it's a career overview, necessarily brief, with a fair amount of attention lavished on his silent pictures. 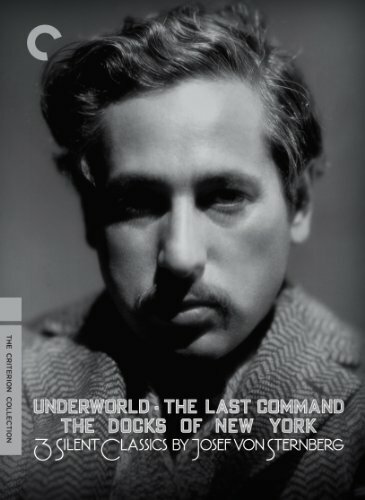 The ample accompanying booklet includes essays on each of the films and note on their accompanying scores; an excerpt from the von Sternberg memoir, discussing Jannings; and Hecht's crackling original story for Underworld.